Saguaro East 07/05/14 2:13 p.m.
Click photos to enlange It’s hard for people outside of the desert southwest to understand why we get so excited when the summer rains come. For one, it’s often been months since we had any measurable rainfall. This year Tucson hasn’t had any rain to speak of since February. But for true desert dwellers, it’s a number of factors. First the sheer drama of monsoon storms. They build quickly and often discharge violently with torential rain and multiple lightning strikes. The changes in the sky in the hour or so leading up to a monsoon storm are mercurial and intense. When the wind starts to abruptly pick up, it’s time to seek shelter ASAP. Saguaro East 07/05/14 3:38 p.m. The storm itself is a sight to experience. The rain beats down thick and hard, flooding streets and turning dips in the road into lakes inside of just a few minutes. The boom and crackle of thunder punctuates the sound of driving rain. Eventually it calms down as the low rumble of thunder booms off in the distance. The air is suddenly cool after having been 100 degrees or more earlier in the day. In the next day or two, the desert grows flush with a sudden bloom of green. Every desert plant soaks up the moisture. It is a time of abundance. For a photographer it is the dream time. I love shooting broad panoramas, and this time of year the sky is as majestic as the landscape, and far more volitile. 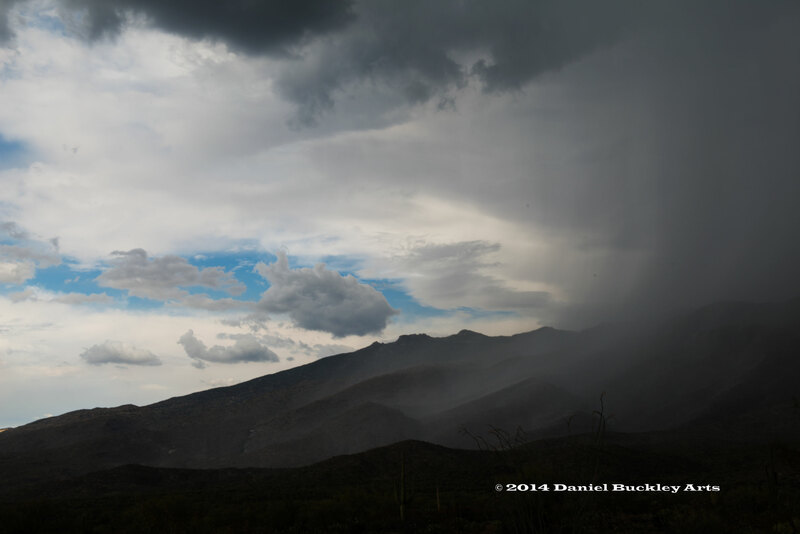 Saguaro East 07/05/14, 4:00 p.m. I typically set up two cameras a few hours before the storm is coming in. One is a video camera, anchored as tightly as possible and focused on an intereseting section of terrain with a strong possibility of weather. The larger mountains to the north and east in Tucson – the Catalinas and Rinsons, respectively – have both the geologic and geometric interest and the height to push clouds to the point pf condensation. They’re pretty dependable points to shoot. The video camera shoots continuously for two to four hours, capturing the slow bubbling and buildup of the storm clouds. A second tripod holds the camera with which I construct my panoramas. During storm season I shoot vertical slices of the horizon, overlapping the previous shot by about 30 percent to give photoshop common landmarks when I stitch the individual shots into a broad composite. The camera shoots full frame, 36 MP photos. A third camera with a 30-200 mm zoom allows me to take detail shots. Saguaro East 07/05/14, 4:19 p.m. When the storms are hours away I might rotate the panoramic camera 360 degrees every 15 minutes or so. During the last two hours that time gets down to roughly every five minutes, pausing to shoot a few details with the zoom camera in the meantime. In the final minutes I generally shoot panoramic slices continuously as the sky in changing literally second to second. When I hear thunder I typically pack up the camera. I have know folks who have been hit by lightning and they seem less than enthusiastic about repeating the experience. If you can hear thunder, lightning is within range to hit you. On July 5 we had a whopper of a storm in which two separate thunderheads suddenly converged over the Rincon Mountains and flooded out into the valley. I was shooting at an overloop at Saguaro National Park east. There was no thunder at first but I could see rain getting closer and closer, and suddenly the wind nearly carried off the two tripod-mounted cameras. I hit the quick release tripod heads and literally tossed the cameras into the front seat, then struggled to collapse the tripods as the first rounds of wind and hail hit me. Saguaro East 07/05/14 4:25 p.m. I drove the loop road as quickly as safety and speed limits would permit and headed out onto surface streets just about the time that the full brunt of the storm hit. The wiper blades couldn’t move fast enough to keep up with the pounding rain and I could barely seebeyond the hood of the car at times, but I was determined to get as far away as I could before the washes turned into rivers. The storm remained that intense for about 10 miles, then suddenly I hit a dry spot and was bathed in sunlight. It was dry by the time I reached my house, but no sooner had I put the cameras inside and parked the car than a soaking rain hit my home. Lots of lightning on my side of town so I waited a while until things let up to start the computer and input my footage and stills. The shear size of the panoramic stills has made constructing composite images a slow process. But in doing so I am seeing quite clearly the speed and shape of the advancing storms. It’s worth noting that in all of the photos I kept the camera settings exactly the same to show the contrast from the bright sunlight at the start of the day to the epic darkness at the moment the storm struck. The time lapse video, which focuses on the Catalina mountains, shows that this range was still in the building stage when I had to tear down and run. But just minutes after I sped off, it too was engulfed in black rain clouds. ~ by Daniel Buckley on July 7, 2014. I love the energy you put into your work.